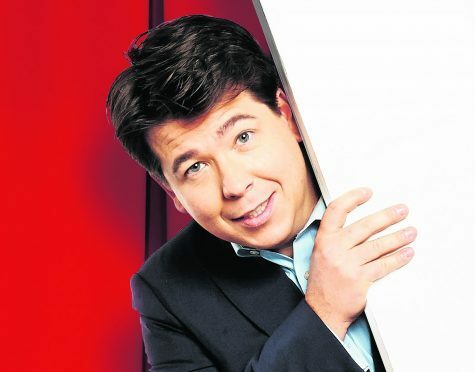 Next week, Michael McIntyre will head to Aberdeen to do what he does best: stand-up comedy. After a three-year absence, the comedian has embarked on a nationwide arena tour with his new show, Happy and Glorious, something he is particularly thrilled to be doing. “I really, really love stand-up,” he said. “There is huge excitement about having done the work in lots of warm-up shows and knowing that the jokes are funny. “I did a comedy gala in Brighton recently to 2,000 people, and it was so lovely to be out there again. It’s wonderful to be able to share my new jokes with people. “I can’t wait to be playing once again to a big room that is really enjoying the show. I’m looking forward to thinking, ‘If you’re loving that, wait till you hear this’. I’m bringing everything to this show – voices, physical comedy, the works. That way, I can really paint pictures on stage. Claiming “anything is ripe for comedy”, Michael said his new show will once again feature anecdotes from his own life – from holidays and hotels to motorway services. “I’ll be discussing health stuff and the fact that I’ve lost a lot of weight,” he added. But there is one new element in Michael’s life that has gifted him an entire section of the show. The comic, who hosted the Royal Variety Performance last year, said: “I’ve bought a house in the country that has given me 20 minutes of material. “I used to flick through Country Life magazine – they tend to be in dentists’ waiting rooms. Over the years, I’d look at page after page of gorgeous country cottages. It was a fantasy of mine to have an idyllic place in the rolling hills, so finally I bought one. But sadly I didn’t realise what I was getting into. Michael McIntyre’s Happy and Glorious show will be at the AECC GE Oil & Gas Arena on November 24 and 25.